For 2012, the GMC Yukon Fleet gains front tow hooks, trailer sway control and hill start assist. It’s powered by an E85-friendly, Flex-Fuel 5.3-liter V8 engine and gets a 6-speed automatic. Remote keyless entry is standard here, along with rear park assist and a rear-view camera, and a CD/MP3 player with Bluetooth, USB and a 3-month subscription to XM radio. There are front bucket and split-folding rear seats, tri-zone climate controls and luggage rack side rails that can be deleted. 17-inch wheels hide 4-wheel antilock disc brakes, and traction and stability control are standard. Daytime running lights are complemented by automatic headlights, and 6 standard airbags keep you safe in the event of a crash. 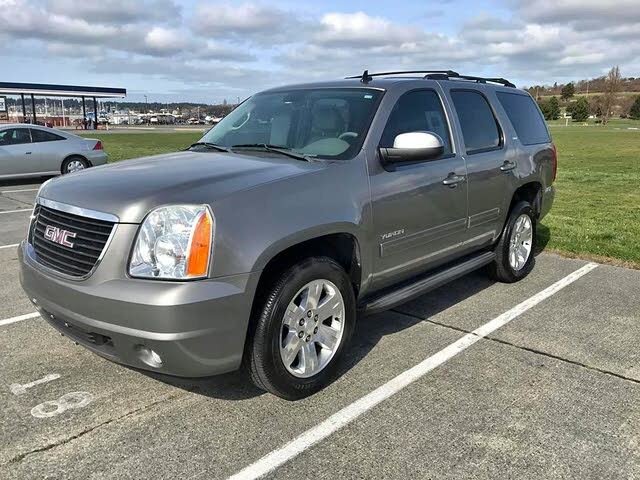 The 2012 GMC Yukon SLE grants you the same 5.3-liter V8 and 6-speed automatic transmission setup as the rest of the lineup, but adds some features not found in the Fleet. Front and rear air conditioning with tri-zone automatic climate controls is standard, and 6-way power front bucket seats are joined by a second-row split bench and a third-row split folding seat good enough for 3 additional passengers. A leather-wrapped tilt and telescoping steering wheel gets radio controls for the Bose stereo, which gets satellite radio, USB, a digital media player connection, Bluetooth and rear radio controls as well. A full power package includes windows, doors and heated power mirrors as well as remote keyless entry, and automatic headlights are joined by daytime running lights and fog lights. The SLE isn’t shy on safety either, with a standard limited-slip differential, traction and stability control, as well as 4-wheel antilock disc brakes. You get front tow hooks, trailer sway control, a 7-wire tow harness and 6 standard airbags. The 4WD version of the 2012 GMC Yukon Fleet doesn’t just get you a single-speed transfer case and locking rear differential, this year GMC has added front tow hooks, trailer sway control and hill start assist. 17-inch alloys get power from the Flex-Fuel 5.3-liter V8 through a 6-speed automatic transmission. You get traction and stability control as well, and some convenience features, too. Rear park assist is joined by a rear-view camera, and the stereo gets a USB input, Bluetooth and a 3-month subscription to XM radio. There are front bucket and split-folding rear seats, luggage rack side rails that can be deleted by preference, and daytime running and automatic headlights. Tri-zone climate controls keep you comfortable, and 6 airbags keep you safe. 4WD power from the 5.3-liter Flex-Fuel V8 gets sent through a 6-speed automatic transmission and limited-slip differential in the 2012 GMC Yukon SLE 4WD. Traction, stability and trailer-sway control will keep things straight when you can’t, and 4-wheel antilock disc brakes wait to clamp down and bring 17-inch alloy wheels to a quick stop. Up front you’ll find a leather-wrapped tilt and telescoping steering wheel, cloth bucket seats with 6-way power and lumbar adjustment for the driver, and a Bose stereo. Entertainment options are flush with satellite radio, a USB input, digital-media player connection and Bluetooth, and rear passengers get radio controls as well as the driver through the steering wheel. There’s a full power package with remote keyless entry and heated power mirrors, and automatic headlights are joined by fog and daytime running lights. You’ll get front and rear air conditioning with tri-zone automatic climate controls and front tow hooks for yanking dead weight around. Out back you’ll find a 7-wire tow harness included, and if things get really bad, 6 airbags wait to cushion you in a crash. With a 5.3-liter Flex-Fuel engine and a 6-speed automatic transmission, the 2012 GMC Yukon SLT starts with a powerful foundation and builds on that with luxury features like heated leather front bucket seats with 6-way power, remote engine start and power-adjustable pedals. You’ll get a rear-obstacle detection system and a rear-view camera, as well as a garage door opener. A Bose stereo offers satellite radio, a USB input and digital-media player connection, Bluetooth and auxiliary controls in the rear and on the tilt and telescoping leather-wrapped steering wheel. Automatic headlights are joined by daytime running lights and fog lights, and a roof rack adds some additional exterior storage. There are tri-zone automatic climate controls with front and rear air conditioning and a full power package including heated power mirrors. Safety is handled thanks to a limited-slip differential, traction, stability and trailer-sway control, 4-wheel antilock disc brakes and 6 airbags. The 2012 GMC Yukon SLT 4WD offers you the advantages of front tow hooks, a 7-wire tow harness and a hitch receiver, as well as a 1-speed transfer case with locking rear differential. It’s powered by the Flex-Fuel 5.3-liter V8 and comes with a 6-speed automatic transmission. A host of electronic managers includes traction, stability and trailer-sway control, and 4-wheel antilock disc brakes are ready to slow the 17-inch alloy wheels. Inside you’ll find heated leather bucket seats with 6-way power and lumbar adjustment for the driver. There’s leather on the tilt and telescoping steering wheel as well, and the pedals are power adjustable. Tri-zone automatic climate controls with front and rear air conditioning keep passengers comfortable, and a Bose stereo comes with satellite radio, USB and digital-media connection and Bluetooth for entertainment, with additional controls front and rear. There are fog lights, daytime running lights and automatic headlights, and a full power package includes remote engine start and entry and heated power mirrors. A rear-obstacle detection system is supplemented by a rear camera and 6 airbags are standard with front, front-side and curtain-side units.